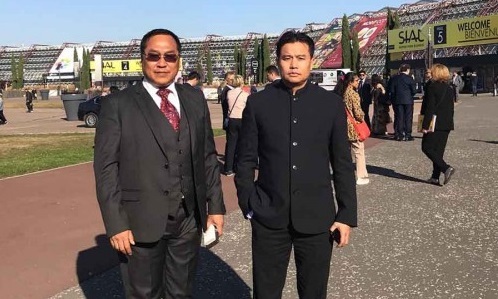 Manipur Minister of Textiles, Commerce and Industry, Thongam Biswajit Singh accompanied by its principal secretary, P Vaiphei, reached Paris on Monday to participate in the SIAL-2018 World Food Exhibition Event to be held in the city as part of the Indian delegation led by Union Minister of State for Food Processing Industries, Government of India, Harsimrat Kaur. SIAL-2018 is known to be the world’s largest exhibition of food processing sector. The event offers wide experience on the latest developments in the sector which is a key area in the context of the efforts of the department of Trade, Commerce and Industries which is making concerted efforts in convergence with department of Horticulture and Soil Conservation to tap the huge potentials of the state in its organic food products under the Central government’s Kisan-SAMPADA initiatives. Highlighting on the tour, Biswajit expressed his desire to give a fillip to the food processing industry sector in Manipur with more government interventions, especially with the State’s good natural resources of agri-horticulture products. The Minister was of the view that this will go a long way for the State’s farmers and entrepreneurs in achieving economic sustenance and better livelihood on one hand and prevent the wastages encountered due to lack of cold storages, food processing infrastructures, latest technologies and know-how on the other hand. The Minister also expressed desire for better economic utilization of the State’s salubrious climate and very fertile soil to produce more agri-horticulture products based on more scientific and modern methods while focusing on the vast potentials of organic farming and availability of niche markets for organic agri-horticulture products. He further stressed on enhancing the quality of the natural fruits of the State like pineapples, oranges, lemons and others which are much higher in juice content and far better in taste than those found elsewhere. He also reiterated the huge potential of famous U-Morok (ghost chilli), which can capture a nice market as much as the state’s equally famous and exotic Chak-hao (black rice), which has gained tremendous popularity and preference to most of the visitors to the State.